Mongabay, a leading resource for news and perspectives on environmental and conservation issues related to the tropics, has launched Tropical Conservation Science - a new, open access academic e-journal. It will cover a wide variety of scientific and social studies on tropical ecosystems, their biodiversity and the threats posed to them. Tropical Conservation Science - March 8, 2008. At the 148th Meeting of the OPEC Conference, the oil exporting cartel decided to leave its production level unchanged, sending crude prices spiralling to new records (above $104). OPEC "observed that the market is well-supplied, with current commercial oil stocks standing above their five-year average. The Conference further noted, with concern, that the current price environment does not reflect market fundamentals, as crude oil prices are being strongly influenced by the weakness in the US dollar, rising inflation and significant flow of funds into the commodities market." OPEC - March 5, 2008. Kyushu University (Japan) is establishing what it says will be the world’s first graduate program in hydrogen energy technologies. The new master’s program for hydrogen engineering is to be offered at the university’s new Ito campus in Fukuoka Prefecture. Lectures will cover such topics as hydrogen energy and developing the fuel cells needed to convert hydrogen into heat or electricity. Of all the renewable pathways to produce hydrogen, bio-hydrogen based on the gasification of biomass is by far both the most efficient, cost-effective and cleanest. Fuel Cell Works - March 3, 2008. An entrepreneur in Ivory Coast has developed a project to establish a network of Miscanthus giganteus farms aimed at producing biomass for use in power generation. In a first phase, the goal is to grow the crop on 200 hectares, after which expansion will start. The project is in an advanced stage, but the entrepreneur still seeks partners and investors. The plantation is to be located in an agro-ecological zone qualified as highly suitable for the grass species. Contact us - March 3, 2008. A 7.1MW biomass power plant to be built on the Haiwaiian island of Kaua‘i has received approval from the local Planning Commission. The plant, owned and operated by Green Energy Hawaii, will use albizia trees, a hardy species that grows in poor soil on rainfall alone. The renewable power plant will meet 10 percent of the island's energy needs. Kauai World - February 27, 2008. The European Union's Joint Research Centre recently revised its comprehensive well-to-wheel (WTW) study for different automotive fuels after criticism (channeled through public consultation) had arisen over the previous study which didn't take into account biogas as a viable transport fuel. The revised version now in fact shows that compressed biogas (CBG) is the most climate friendly of more than 70 different fuels (and fuel paths used in different propulsion technologies). The fuels and pathways studied also show why hydrogen is out of business for the time being. The report shows that hydrogen can only be produced efficiently and in a climate-friendly manner from biomass and wind, but quickly dismisses the wind option because using dedicated wind farms is too expensive compared to biomass, whereas relying on on-site production using excess wind electricity, poses problems with reliability and availability of supply. Hydrogen production paths based on fossil fuels (coal, natural gas, petroleum) are not more efficient than using biomass as a primary energy source, and of course have a huge CO2 burden. Moreover, using these fossil fuels for other fuel paths (Fischer-Tropsch synthetic diesel, methanol or CNG) is more efficient than using it for either compressed or liquid hydrogen. Nuclear as a primary energy source to produce hydrogen from the electrolysis of water is very clean, but extremely expensive and the most inefficient of all pathways (electrolysis requires large amounts of energy). This leaves biohydrogen. Of all pathways, compressed hydrogen produced from biomass (in this case wood), to be used in fuel cells, is both the most efficient pathway and lowest on GHG-emissions (graph, click to enlarge). The problem is that the primary biomass can be better used for other fuel pathways, resulting in fuels with an even higher WTW efficiency and lower CO2-emissions (biomass-to-liquids or simply biogas). When looking at the costs of the fuels over their entire well-to-tank (WTT) and tank-to-wheel (TTW) parcours, biohydrogen does not stand a chance of being introduced anywhere soon. As is well known, on the WTT-side, an entirely new and costly infrastructure to store and distribute hydrogen has to be established, whereas on the TTW-side, fuel cells are still very expensive. Furthermore, using biohydrogen in internal combustion engines is both less efficient and less climate friendly than using the biomass for other fuel paths resulting in fuels that can be used just as well in ICE's. If the ICE is going to be the propulsion technology that must overcome the high TTW costs resulting from expensive fuel cells, the detour via hydrogen is futile. This is best illustrated by the fact that biogas is one of the best primary energy sources for biohydrogen. But biogas can simply be used in an existing CNG-vehicle. Making the detour via hydrogen does not contribute to lower GHG-emissions, is less efficient, and far more expensive. The revised study recognizes the CO2 benefits of compressed biogas (CBG), or biomethane. Of all 70 possible fuel paths, the WTW-efficiency of compressed biogas used in a dedicated propulsion technology, is also (far) higher than classic biofuels (ethanol, biodiesel), roughly equal to more advanced fuels (synthetic diesel from biomass and biomethanol used in next-generation ICE's, biohydrogen in fuel cells), and almost as efficient as non-renewable advanced fuels (syndiesel from coal-to-liquids and gas-to-liquids, and methanol used in advanced ICE's). 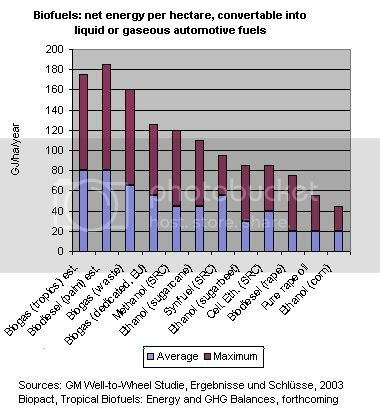 Moreover, as an earlier WTW-study published by General Motors (which already included biogas) indicates, of all biofuels feedstocks and production pathways, biogas yields more per hectare than other energy crops. At the end of the WTT path, it results in a higher amount of energy ready to be used by the TTW path (this is especially so compared to biofuels based on low yielding crops cultivated in the North, such as corn) (see illustration). Biogas can also be produced economically from dedicated energy crops (such as maize or grasses), which results in a fuel that is less costly than either first generation ethanol or biodiesel. Compressed biogas can be used in existing CNG-vehicles (often these are bi-fuel vehicles that run on either CNG/biogas or gasoline), and it is to be expected that efficiency increases in this propulsion technology will be achieved over the coming years. The ideal (and feasible) propulsion technology would be a CBG-hybrid. According to the report, such a hybrid would be more efficient than an advanced diesel hybrid. Many countries (especially in Scandinavia and Central Europe) have meanwhile recognized the potential of biogas as an automotive fuel and are investing in it heavily. 1. biogas can be produced from dedicated energy crops in a far more competitive way because biogas crop yields in the tropics and subtropics are higher and the costs of inputs are far lower (land, labor). 2. developing countries are not burdened by existing fossil fuel infrastructures. They can decide to build an infrastructure from scratch and leapfrog into a fuel efficient, energy secure, and climate friendly future. Pakistan offers the best example, with its decision to build a CNG-infrastructure, which resulted in 1 million CNG-vehicles on the road in less than 2 years time - the world's biggest CNG-fleet. Establishing a CBG-infrastructure would be similar to the way Pakistan created its compressed natural gas infrastructure. 3. as carbon markets globalise, developing countries stand to benefit financially from radically choosing for a green, CBG infrastructure today. The CO2 credits they would obtain can be traded on a global market. In the coming days, we will be looking at other fuels mentioned in the WTW-analyses made by the Joint Research Centre. Even though such analyses are fairly complex, other WTW studies offer comparative data, from which we can derive a global picture of the efficiency and climate friendly nature of future fuels. For the biogas energy yields per hectare, see: Reinhold Wurster, GM Well-to-Wheel-Studie - Ergebnisse und Schlüsse sowie Vergleich mit anderen Arbeiten und Ausblick auf Kraftstoffpotentiale und -kosten, L-B- Systemtechnik GmbH Ottobrunn, 06 November 2003. * Establish, in a transparent and objective manner, a consensual well-to-wheels energy use and Greenhouse gas (GHG) emissions assessment of a wide range of automotive fuels and powertrains relevant to Europe in 2010 and beyond. * Consider the viability of each fuel pathway and estimate the associated macro-economic costs. * Have the outcome accepted as a reference by all relevant stakeholders. This new version is the result of wide consultation with relevant third parties, leaving the opportunity for each actor, stakeholder, or member of the technical/scientific community to take part in the on-going discussions, and to contribute with up-dated or corrected inputs. The process is still open, and a dedicated mailbox ([email protected]) has been created: further input data and comments are warmly welcome. The 2006 version includes a number of new and updated pathways as well as revised cost calculations and availability estimates. o Cost data and calculations. o Energy requirement and GHG emissions for gasoline and diesel fuel production. * The Tank-to-Wheels (TTW) report [*pdf] decribes the vehicle configurations and performance.The appendix gives details on vehicles retail price estimation. Do these studies take the ammount of energy required to compress the biogas?